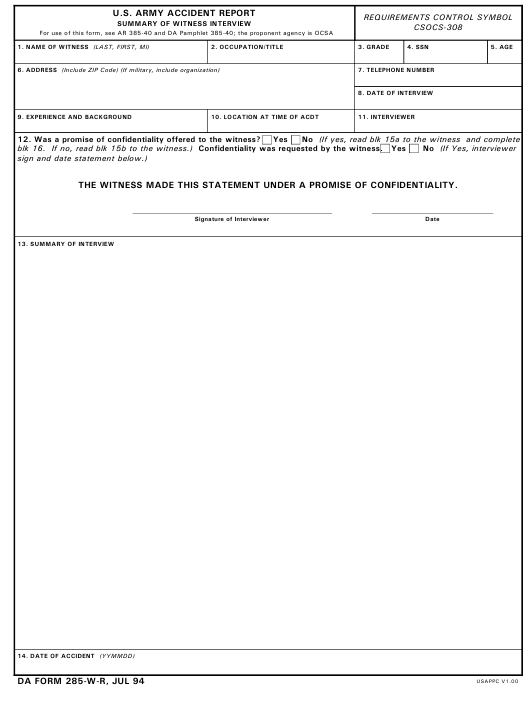 DA Form 285-w-r - also known as the "Accident Report Summary Of Witness Interview" - is a Military form issued and used by the United States Department of the Army. The form - often mistakenly referred to as the DD form 285-w-r - was last revised on July 1, 1994. Download an up-to-date PDF version of the DA 285-w-r below or request a copy through the chain of command. 12. Was a promise of confidentiality offered to the witness? blk 16. If no, read blk 15b to the witness.) Confidentiality was requested by the witness. THE WITNESS MADE THIS STATEMENT UNDER A PROMISE OF CONFIDENTIALITY. a. Promise of confidentiality offered. b. No promise of confidentiality offered. of AR 385-40 for the purpose of conducting a safety investigation. and are also required to inform you of their purpose and of your legal rights. purpose and of your legal rights. safety and accident prevention only. interview will not be released to the public or outside DOD safety channels. public pursuant to a Freedom of Information Act request. and the interviews for safety and accident prevention purposes. prevention, and may not be used as evidence in connection with any administrative or disciplinary proceeding. release outside of the military, then your interview must be pursuant to a promise of confidentiality. the military under the Freedom of Information Act. outside of the military under the Freedom of Information Act.